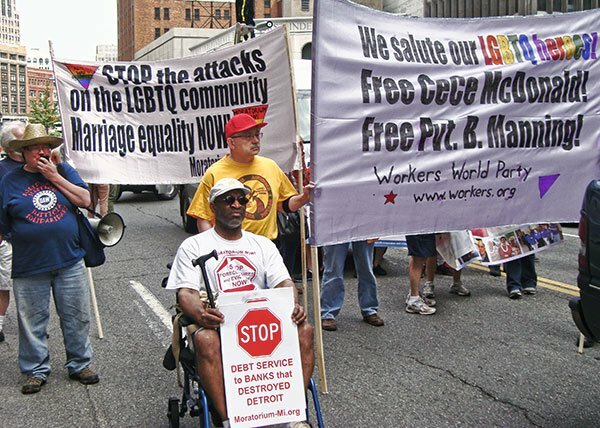 Once again, Moratorium Now/MECAWI and Workers World Party will be marching in the annual LGBTQ Motor City Pride Parade. To join contingent in the Parade, gather at 10:30 am on Sunday, June 8, at Fort and Griswold and look for our banners. We will also have a literature table at the Pride festival at Hart Plaza. Table slots are 1:00-3:00, 3:00-5:00 and 5:00-7:00 on Saturday, June 7 and 12:00-2:00, 2:00-4:00 and 4:00-6:00 Sunday, June 8. Please email Martha Grevatt, grevatt.m@gmail.com, if you can join our contingent in the parade and/or take a two hour slot at our literature table.